Moraines on a side glacier of the Gorner Glacier, Zermatt, Switzerland. The lateral moraine is the high snow-free bank of debris in the top left hand quarter of the picture. 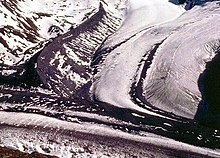 The medial moraine is the double line of debris running down the centre-line of the glacier. Moraines are accumulations of debris that are found in regions where there are glaciers or were glaciers formerly. Moraines which are found far off from existing glaciers were created during a past ice age. The debris may have been taken off the valley floor as a glacier moved or fallen off the valley walls as a result of weathering. Moraines may be made of silt like glacial flour to large boulders. Moraines may be on the glacier’s surface or deposited as piles or sheets of debris where the glacier has melted. Moraines may also develop when a glacier or iceberg reaches the sea and melts, dropping rocks that it has carried. Wikimedia Commons has media related to Moraine. This page was last changed on 25 January 2018, at 02:38.